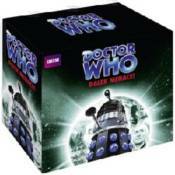 A collectible slipcase containing three exciting Doctor Who audiobooks, each featuring the Daleks! In "Daleks: The Chase," the TARDIS is pursued through Time and Space by the Daleks, who are intent on preventing any future intervention in their plans by the Doctor. In "Daleks: Mission to the Unknown" and "Daleks: The Mutation of Time," the leader of Earth in the far future, Mavic Chen, has allied himself with the Daleks. When the Doctor steals the core of the Time Destructor, his arch enemies pursue him across the galaxy in order to retrieve it. Read by Maureen O'Brien, Peter Purves and Jean Marsh, with original sound design, and Nicholas Briggs as the voice of the Daleks.